Imagine a future in which you can think, “Hey, I’m thirsty,” then shoot off a quick text and have an ice-cold beverage magically appear in front of you. It may not be quite so instantaneous, but in a way, that future is now. 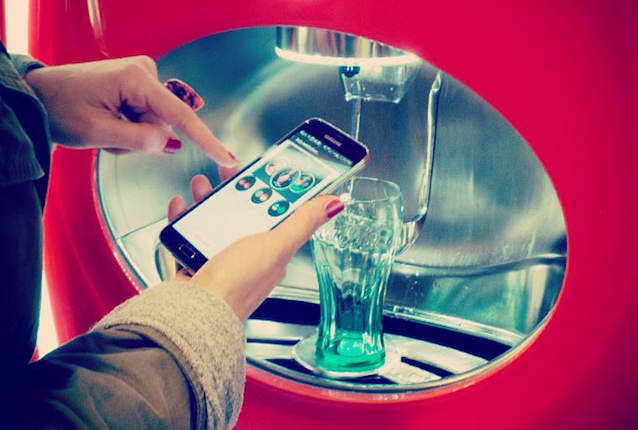 You may already know of the My Coke Rewards program, which lets you input codes from the bottoms of bottle caps to rack up points for various rewards. What you may not know is you can now link your MCR account balance to your mobile wallet via Applet Wallet or Android Pay, giving you the ability to take your points on the go and redeem them for drinks at Coca-Cola vending machines. How does this help your immediate thirst? Right now, you can score enough points for one free Coke product by texting “wallet” to 2653 (COKE), as reported on Couponaholic. You’ll receive a link that lets you add a digital MCR card with 30 pre-loaded points — enough for one free Coke product — to your Apple Wallet or Android Pay account. You can redeem these points for a complimentary beverage of your choice at participating vending machines. Sounds pretty refreshing to us! Your Turn: What do you think? Is this deal sweet enough for you to participate?